a serine protease coagulation factor in normal plasma that forms a complex with its cofactor, factor V, to convert prothrombin to thrombin. Also called Stuart-Prower factor. Coagulation factor X, prothrombase, prothrombinase, Stuart Prower factor Hematology A vitamin K-dependent enzyme which is the key protein in all–intrinsic, extrinsic, common coagulation pathways, converting prothrombin to thrombin. See Factor X deficiency. 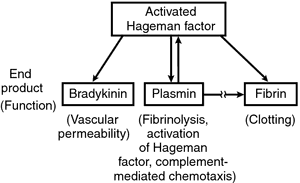 A plasma coagulation factor that assists in the conversion of prothrombin to thrombin.